I hope that none of you were starting to doubt my commitment to the ‘summer of pickling’. The pickling is still going strong, my friends. Last week, Nich and I spotted some fresh okra at the local farmers market, and we knew immediately that the okra was going to be our next pickling project. I can’t say that I’ve eaten a ton of pickled okra in my 29 years, but what I’ve had has always been delicious. And, if we are being honest…I generally only eat pickled okra when it happens to be garnishing my bloody mary. This recipe isn’t too far off from the other pickled veggies I’ve been trying my hand at. Most pickle brines are a combination of vinegar, water, sugar, salt, and spices. The kinds and amounts of vinegars, spices, etc, vary upon preference and type of pickle. I’ve learned that you really just need to make a few jars, eat them, and decide what you’d change next time. I’ve decided, for example, that I don’t like much garlic in my dill pickles. 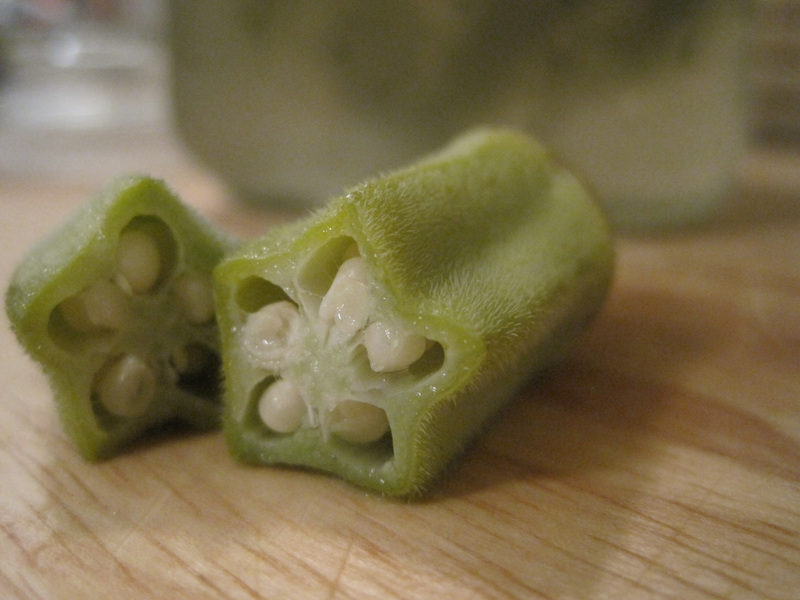 Anyway, this okra recipe seemed very open-ended and somewhat free form. The original recipe calls for hot peppers, but states that they can be fresh or dried. My left brain only slightly imploded at that notion. Dried & fresh peppers taste very different and so I knew that whichever form of pepper I chose would have a big impact on the flavor of the pickled okra. However, I happened to have dried habaneros on hand, so convenience won out. The recipe also called for two to three hot peppers. But, I didn’t want to go crazy on my first try at pickling okra, and we all know that habaneros can be intense. So, I only used one habanero for fear of an overly-spicy okra. But, alas, they don’t seem to be super spicy and next time, I’ll probably kick it up a notch and use two. Just saying. Rinse the okra and peel the garlic cloves. Scrub the jar, ring and lid and rinse in very hot water from the tap. When the jar cools enough to touch, pack the jar with whole okra pods stood upright. Pack in the dill, garlic cloves and peppers as well. Make sure nothing in the jar protrudes up beyond the lower edge of the lip of the jar. In a medium pot, add the water, vinegar and salt to make the brine. Bring to a boil. Pour the boiling brine into the packed jars. Make sure nothing in the jar is left uncovered. Seal the jars tightly. Wait a week to open. Best served cold after refrigeration. I’ve always had a love/hate relationship with okra. I’ve had it fried and crunchy (yum) and stewed and slimy (yuck). I’m excited to give the pickled version a shot!